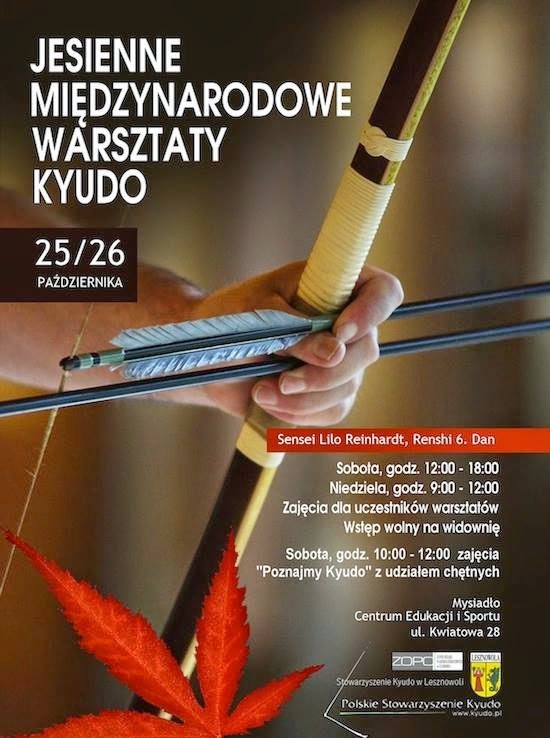 Congratulations to Poland on 15 years of Kyudo! | The Kyudo Project Blog! 15 years ago, Kyūdō made its way to Poland. Over the course of these fifteen years, thanks to the commitment of a group of enthusiasts, it is steadily strengthening and expanding its presence. This October, we're officially starting our celebration of the fifteenth anniversary of Kyūdō in Poland. We therefore wish to invite you to the opening ceremony of the Autumn International Kyūdō Workshop, which is scheduled to start on October 25, 2014, at 1 P.M., in the sports hall of Centrum Edukacji i Sportu w Mysiadle (150 meters from Warsaw). The exact address is Kwiatowa 28, Mysiadło. — at Kwiatowa 28, Mysiadło.